Linux Mint 17 is a long term support release which will be supported until 2019. It comes with updated software and brings refinements and many new features to make your desktop experience more comfortable to use. The Update Manager was hugely improved. It shows more information, it looks better, it feels faster, and it gets less in your way. It no longer needs to reload itself in root mode when you click on it. It no longer checks for an Internet connection or waits for the network manager and it no longer locks the APT cache at session startup. The UI was improved, the icons were modified a bit and the changelog retrieval is now much faster and more reliable. A new "type" column was added to differentiate between traditional updates, security updates, backports and romeo updates. Security updates can now bypass safety levels and two new options were added for you to decide if they should always be visible and if they should be selected. By default these options are respectively set to True and to False. 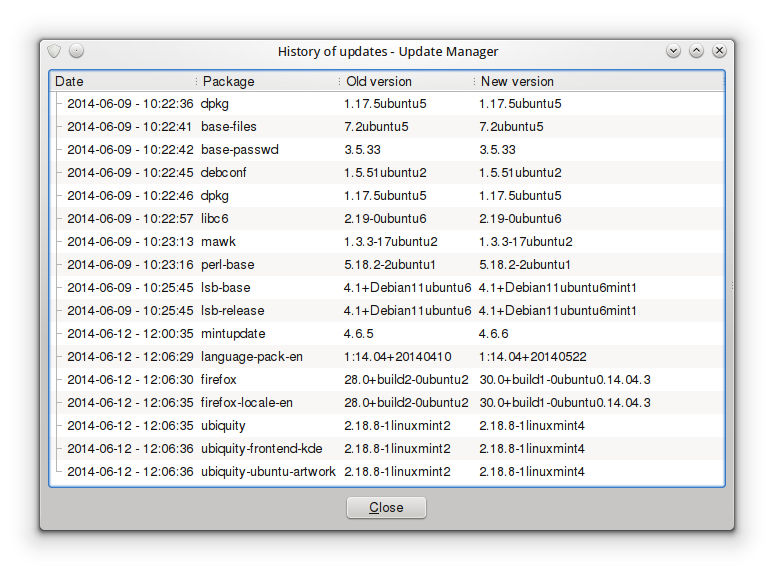 The history of updates used to only cover the updates performed by the Update Manager. This is no longer the case. They now feature all updates performed on the system, whether it's with the Update Manager, apt-get, aptitude or even directly with gdebi or dpkg. 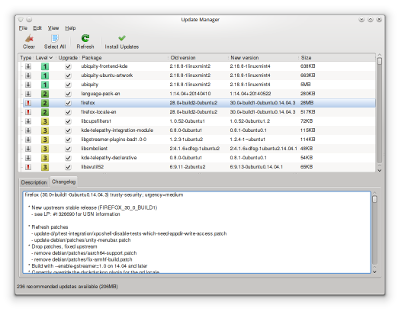 A new section of the Update Manager presents all the available kernels. The development team will use this section to give you relevant information about new kernels, what they fix, what they break, so you can decide which kernel is right for you. 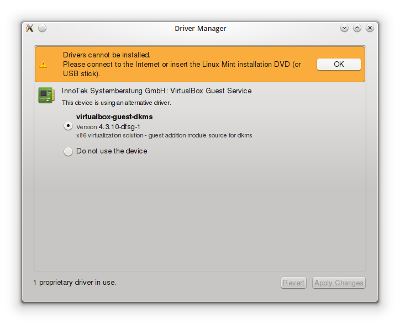 The Driver Manager is now able to install drivers without a connection to the Internet. When offline, the Driver Manager asks you to plug in the installation medium and proceeds to mount it as a temporary package repository. 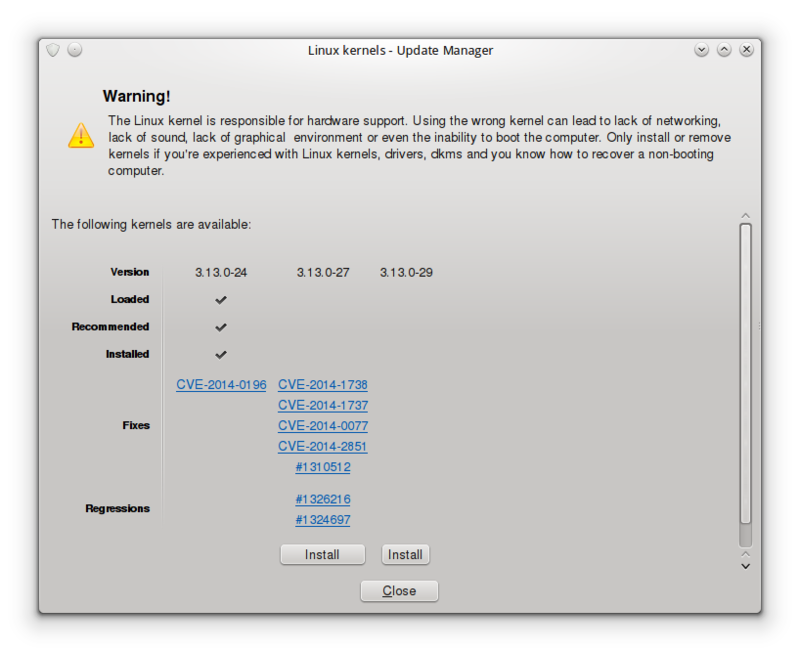 It's now much easier for instance to install Linux Mint on laptops equipped with Broadcom wireless chipsets, and you no longer need an an ethernet cable. MDM was refined, and it received new features and important bug fixes. The HTML greeter now comes with HiDPI support. MDM is also now able to detect your session and your language and it preselects them by default. Finally, MDM comes with a recovery command. If you find yourself unable to log in, you can press CTRL+ALT+F1 to log in the console, and type "mdm-recovery". This command gives MDM a safe configuration, it switches it to the GTK greeter, enables the logs and restarts your computer. 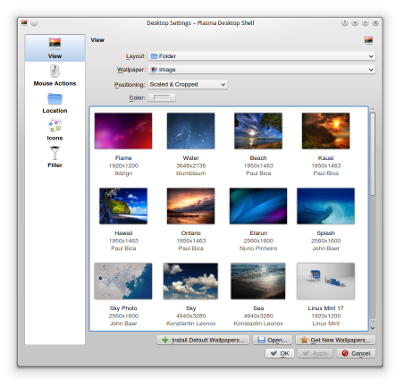 The "Software Sources" configuration tool received a few UI and usability improvements. A warning was added against the use of the "backport" and "romeo" components of the Linux Mint repositories. For each of these, a confirmation dialog explains in detail what they are, who they are for and when and why they should or shouldn't be activated. The welcome screen was redesigned and no longer uses webkit. It uses less resources and launches much faster. 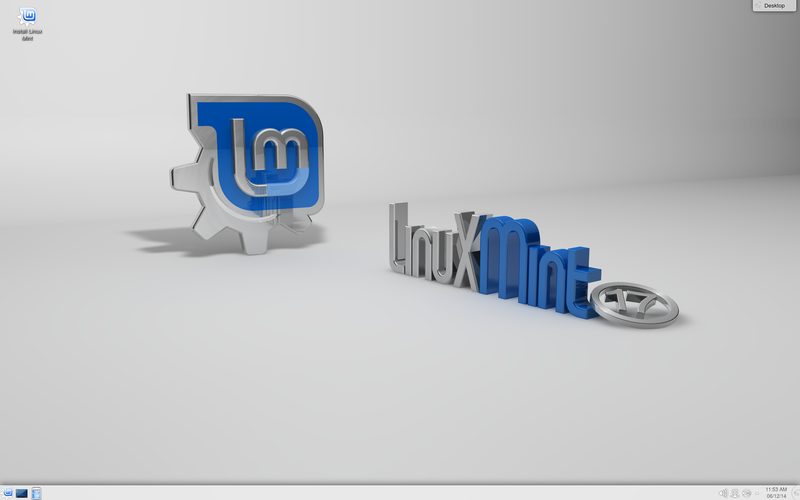 The previous version of Linux Mint used KDE 4.11. 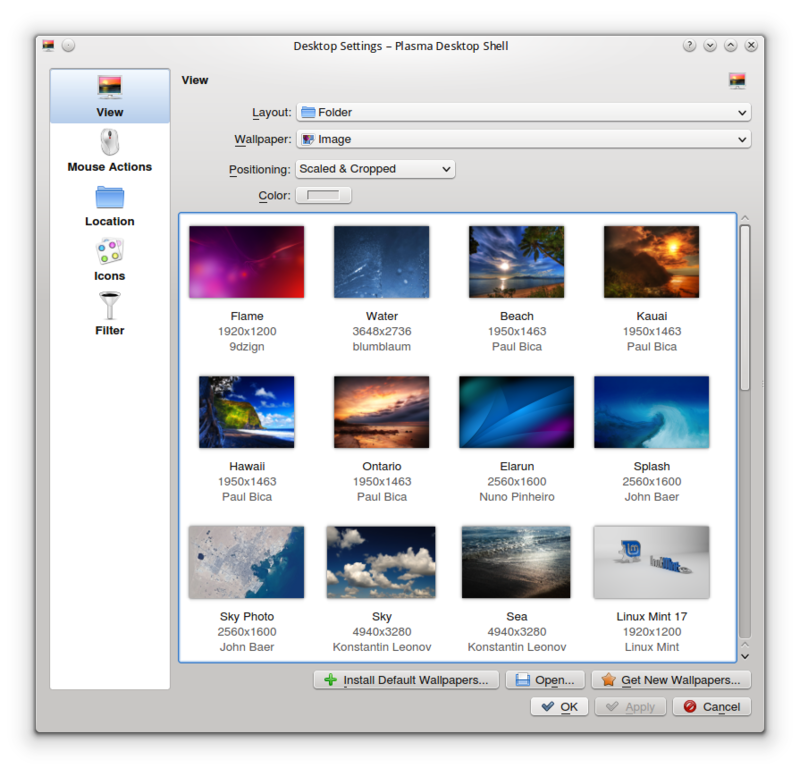 In this release, KDE is upgraded to version 4.13. The shutdown sequence was fixed. 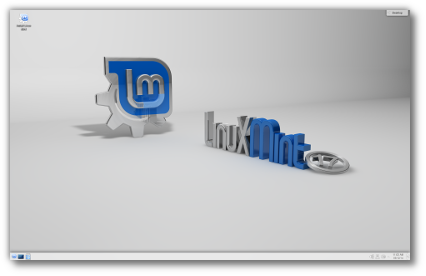 Linux Mint 17 features KDE 4.13, MDM 1.6, a Linux kernel 3.13 and an Ubuntu 14.04 package base. 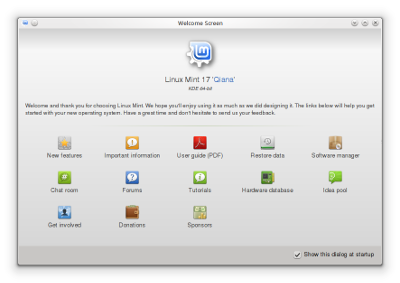 Linux Mint 17 will receive security updates until 2019. 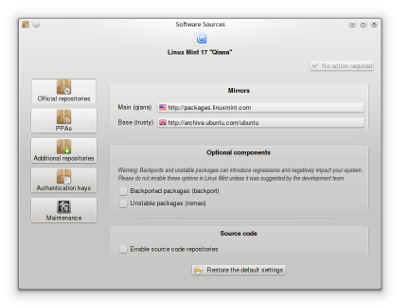 Until 2016, future versions of Linux Mint will use the same package base as Linux Mint 17, making it trivial for people to upgrade.